"Charles X" redirects here. For other uses, see Charles X (disambiguation). Charles X (Charles Philippe; 9 October 1757 – 6 November 1836) was King of France from 16 September 1824 until 2 August 1830. For most of his life he was known as the Count of Artois (French: comte d'Artois). An uncle of the uncrowned Louis XVII and younger brother to reigning kings Louis XVI and Louis XVIII, he supported the latter in exile. After the Bourbon Restoration in 1814, Charles became the leader of the ultra-royalists, a radical monarchist faction within the French court that affirmed rule by divine right and opposed the concessions towards liberals and guarantees of civil liberties granted by the Charter of 1814. Charles gained influence within the French court after the assassination of his son Charles Ferdinand, Duke of Berry, in 1820 and eventually succeeded his brother in 1824. His reign of almost six years proved to be deeply unpopular from the moment of his coronation in 1825, in which he tried to revive the practice of the royal touch. The governments appointed under his reign reimbursed former landowners for the abolition of feudalism at the expense of bondholders, increased the power of the Catholic Church, and reimposed capital punishment for sacrilege, leading to conflict with the liberal-majority Chamber of Deputies. Charles also initiated the French conquest of Algeria as a way to distract his citizens from domestic problems. He eventually appointed a conservative government under the premiership of Prince Jules de Polignac, who was defeated in the 1830 French legislative election. He responded with the July Ordinances disbanding the Chamber of Deputies, limiting franchise, and reimposing press censorship. Within a week France faced urban riots which lead to the July Revolution of 1830, which resulted in his abdication and the election of Louis Philippe I as King of the French. Exiled once again, Charles died in 1836 in Gorizia, then part of the Austrian Empire. He was the last of the French rulers from the senior branch of the House of Bourbon. Charles Philippe of France was born in 1757, the youngest son of the Dauphin Louis and his wife, the Dauphine Marie Josèphe, at the Palace of Versailles. Charles was created Count of Artois at birth by his grandfather, the reigning King Louis XV. As the youngest male in the family, Charles seemed unlikely ever to become king. His eldest brother, Louis, Duke of Burgundy, died unexpectedly in 1761, which moved Charles up one place in the line of succession. He was raised in early childhood by Madame de Marsan, the Governess of the Children of France. At the death of his father in 1765, Charles's oldest surviving brother, Louis Auguste, became the new Dauphin (the heir apparent to the French throne). Their mother Marie Josèphe, who never recovered from the loss of her husband, died in March 1767 from tuberculosis. This left Charles an orphan at the age of nine, along with his siblings Louis Auguste, Louis Stanislas, Count of Provence, Clotilde ("Madame Clotilde"), and Élisabeth ("Madame Élisabeth"). In November 1773, Charles married Marie Thérèse of Savoy. In 1775, Marie Thérèse gave birth to a boy, Louis Antoine, who was created Duke of Angoulême by Louis XVI. Louis-Antoine was the first of the next generation of Bourbons, as the king and the Count of Provence had not fathered any children yet, causing the Parisian libellistes (pamphleteers who published scandalous leaflets about important figures in court and politics) to lampoon Louis XVI's alleged impotence. Three years later, in 1778, Charles' second son, Charles Ferdinand, was born and given the title of Duke of Berry. In the same year Queen Marie Antoinette gave birth to her first child, Marie Thérèse, quelling all rumours that she could not bear children. Charles was thought of as the most attractive member of his family, bearing a strong resemblance to his grandfather Louis XV. His wife was considered quite ugly by most contemporaries, and he looked for company in numerous extramarital affairs. According to the Count of Hézecques, "few beauties were cruel to him." Among his lovers where notably Anne Victoire Dervieux. Later, he embarked upon a lifelong love affair with the beautiful Louise de Polastron, the sister-in-law of Marie Antoinette's closest companion, the Duchess of Polignac. Charles also struck up a firm friendship with Marie Antoinette herself, whom he had first met upon her arrival in France in April 1770 when he was twelve. The closeness of the relationship was such that he was falsely accused by Parisian rumour mongers of having seduced her. As part of Marie Antoinette's social set, Charles often appeared opposite her in the private theatre of her favourite royal retreat, the Petit Trianon. They were both said to be very talented amateur actors. Marie Antoinette played milkmaids, shepherdesses, and country ladies, whereas Charles played lovers, valets, and farmers. A famous story concerning the two involves the construction of the Château de Bagatelle. In 1775, Charles purchased a small hunting lodge in the Bois de Boulogne. He soon had the existing house torn down with plans to rebuild. Marie Antoinette wagered her brother-in-law that the new château could not be completed within three months. Charles engaged the neoclassical architect François-Joseph Bélanger to design the building. In 1781, Charles acted as a proxy for Holy Roman Emperor Joseph II at the christening of his godson, the Dauphin Louis Joseph. Charles's political awakening started with the first great crisis of the monarchy in 1786, when it became apparent that the kingdom was bankrupt from previous military endeavours (in particular the Seven Years' War and the American War of Independence) and needed fiscal reform to survive. Charles supported the removal of the aristocracy's financial privileges, but was opposed to any reduction in the social privileges enjoyed by either the Church or the nobility. He believed that France's finances should be reformed without the monarchy being overthrown. In his own words, it was "time for repair, not demolition." King Louis XVI eventually convened the Estates General, which had not been assembled for over 150 years, to meet in May 1789 to ratify financial reforms. Along with his sister Élisabeth, Charles was the most conservative member of the family and opposed the demands of the Third Estate (representing the commoners) to increase their voting power. This prompted criticism from his brother, who accused him of being "plus royaliste que le roi" ("more royalist than the king"). In June 1789, the representatives of the Third Estate declared themselves a National Assembly intent on providing France with a new constitution. Necker's dismissal provoked the storming of the Bastille on 14 July. At the insistence of Louis XVI and Marie Antoinette, Charles and his family left France three days later, on 17 July, along with several other courtiers, including the Duchess of Polignac, the queen's favourite. His flight has historically been largely attributed to personal fears for his own safety. However recent research indicates that the King approved in advance of his brother's departure, seeing it as a means of ensuring that one close relative would be free to act as a spokesman for the monarchy after Louis himself had been removed from Versailles to Paris. Charles and his family decided to seek refuge in Savoy, his wife's native country, where they were joined by some members of the Condé family. Meanwhile, in Paris, Louis XVI was struggling with the National Assembly, which was committed to radical reforms and had enacted the Constitution of 1791. In March 1791, the Assembly also enacted a regency bill that provided for the case of the king's premature death. While his heir Louis-Charles was still a minor, the Count of Provence, the Duke of Orléans or, if either was unavailable, someone chosen by election should become regent, completely passing over the rights of Charles who, in the royal lineage, stood between the Count of Provence and the Duke of Orléans. Charles meanwhile left Turin (in Italy) and moved to Trier in Germany, where his uncle, Clemens Wenceslaus of Saxony, was the incumbent Archbishop-Elector. Charles prepared for a counter-revolutionary invasion of France, but a letter by Marie Antoinette postponed it until after the royal family had escaped from Paris and joined a concentration of regular troops under General de Bouillé at Montmédy. After the attempted flight was stopped at Varennes, Charles moved on to Koblenz, where he, the recently escaped Count of Provence and the Princes of Condé jointly declared their intention to invade France. The Count of Provence was sending dispatches to various European sovereigns for assistance, while Charles set up a court-in-exile in the Electorate of Trier. On 25 August, the rulers of the Holy Roman Empire and Prussia issued the Declaration of Pillnitz, which called on other European powers to intervene in France. When the French Revolutionary Wars broke out in 1792, Charles escaped to Great Britain, where King George III of Great Britain gave him a generous allowance. Charles lived in Edinburgh and London with his mistress Louise de Polastron. His older brother, dubbed Louis XVIII after the death of his nephew in June 1795, relocated to Verona and then to Jelgava Palace, Mitau, where Charles' son Louis Antoine married Louis XVI's only surviving child, Marie Thérèse, on 10 June 1799. In 1802, Charles supported his brother with several thousand pounds. 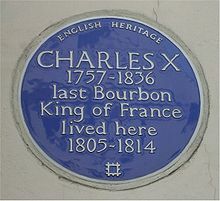 In 1807, Louis XVIII moved to Great Britain. In January 1814, Charles covertly left his home in London to join the Coalition forces in southern France. Louis XVIII, by then wheelchair-bound, supplied Charles with letters patent creating him Lieutenant General of the kingdom. On 31 March, the Allies captured Paris. A week later, Napoleon I abdicated. The Senate declared Louis XVIII restored. Charles arrived in the capital on 12 April and acted as Lieutenant General of the kingdom until Louis XVIII arrived from England. During his brief tenure as regent, Charles created an ultra-royalist secret police that reported directly back to him without Louis XVIII's knowledge. It operated for over five years. Louis XVIII was greeted with great rejoicing from the Parisians and proceeded to occupy the Tuileries Palace. The Count of Artois lived in the Pavillon de Mars, and the Duke of Angoulême in the Pavillon de Flore, which overlooked the River Seine. The Duchess of Angoulême fainted upon arriving at the palace, as it brought back terrible memories of her family's incarceration there, and of the storming of the palace and the massacre of the Swiss Guards on 10 August 1792. Following the advice of the occupying allied army, Louis XVIII promulgated a liberal constitution, the Charter of 1814, which provided for a bicameral legislature, an electorate of 90,000 men and freedom of religion. After the Hundred Days, Napoleon's brief return to power in 1815, the White Terror focused mainly on the purging of a civilian administration which had almost completely turned against the Bourbon monarchy. About 70,000 officials were dismissed from their positions. The remnants of the Napoleonic army were disbanded after the Battle of Waterloo and its senior officers cashiered. Marshal Ney was executed for treason, and Marshal Brune was murdered by a crowd. Approximately 6,000 individuals who had rallied to Napoleon were brought to trial. There were about 300 mob lynchings in the south of France, notably in Marseilles where a number of Napoleon's Mamluks preparing to return to Egypt, were massacred in their barracks. While the king retained the liberal charter, Charles patronised members of the ultra-royalists in parliament, such as Jules de Polignac, the writer François-René de Chateaubriand and Jean-Baptiste de Villèle. On several occasions, Charles voiced his disapproval of his brother's liberal ministers and threatened to leave the country unless Louis XVIII dismissed them. Louis, in turn, feared that his brother's and heir presumptive's ultra-royalist tendencies would send the family into exile once more (which they eventually did). On 14 February 1820, Charles's younger son, the Duke of Berry, was assassinated at the Paris Opera. This loss not only plunged the family into grief but also put the succession in jeopardy, as Charles's elder son, the Duke of Angouleme, was childless. The lack of male heirs in the Bourbon main line raised the prospect of the throne passing to the Duke of Orléans and his heirs, which horrified the more conservative ultras. Parliament debated the abolition of the Salic law, which excluded females from the succession and was long held inviolable. However, the Duke of Berry's widow, Caroline of Naples and Sicily, was found to be pregnant and on 29 September 1820 gave birth to a son, Henry, Duke of Bordeaux. His birth was hailed as "God-given", and the people of France purchased for him the Château de Chambord in celebration of his birth. As a result, his granduncle, Louis XVIII, added the title Count of Chambord, hence Henry, Count of Chambord, the name by which he is usually known. Charles' brother King Louis XVIII's health had been worsening since the beginning of 1824. Suffering from both dry and wet gangrene in his legs and spine, he died on 16 September of that year, aged almost 69. Charles, by now in his 67th year, succeeded him to the throne as King Charles X of France. In his first act as king, Charles attempted to unify the House of Bourbon by granting the style of Royal Highness to his cousins of the House of Orléans, who had been deprived of this by Louis XVIII because of the former Duke of Orléans' role in the death of Louis XVI. While his brother had been sober enough to realize that France would never accept an attempt to resurrect the Ancien Régime, Charles had never been willing to accept the changes of the past four decades. He gave his Prime Minister, Jean-Baptiste de Villèle, lists of laws that he wanted ratified every time he opened parliament. In April 1825, the government approved legislation proposed by Louis XVIII but implemented only after his death, that paid an indemnity to nobles whose estates had been confiscated during the Revolution (the biens nationaux). The law gave government bonds to those who had lost their lands in exchange for their renunciation of their ownership. This cost the state approximately 988 million francs. In the same month, the Anti-Sacrilege Act was passed. Charles's government attempted to re-establish male only primogeniture for families paying over 300 francs in tax, but the measure was voted down in the Chamber of Deputies. On 29 May 1825, King Charles was anointed at the cathedral of Reims, the traditional site of consecration of French kings; it had been unused since 1775, as Louis XVIII had forgone the ceremony to avoid controversy. It was in the venerable cathedral of Notre-Dame at Paris that Napoleon had consecrated his revolutionary empire; but in ascending the throne of his ancestors, Charles reverted to the old place of coronation used by the kings of France from the early ages of the monarchy. That Charles was not a popular ruler became apparent in April 1827, when chaos ensued during the king's review of the National Guard in Paris. In retaliation, the National Guard was disbanded but, as its members were not disarmed, it remained a potential threat. After losing his parliamentary majority in a general election in November 1827, Charles dismissed Prime Minister Villèle on 5 January 1828 and appointed Jean-Baptise de Martignac, a man the king disliked and thought of only as provisional. On 5 August 1829, Charles dismissed Martignac and appointed Jules de Polignac, who, however, lost his majority in parliament at the end of August, when the Chateaubriand faction defected. To stay in power, Polignac would not recall the Chambers until March 1830. On 31 January 1830, the Polignac government decided to send a military expedition to Algeria to put an end to the threat the Algerian pirates posed to Mediterranean trade and also increase the government's popularity with a military victory. The reason given for the war was that the Viceroy of Algeria, angry about French failure to pay debts stemming from Napoleon's invasion of Egypt, had struck the French consul with the handle of his fly swat. French troops invaded Algiers on 5 July. When the official government newspaper, Le Moniteur Universel, published the ordinances on Monday, 26 July, Adolphe Thiers, journalist at the opposition paper Le National, published a call to revolt, which was signed by forty-three journalists: "The legal regime has been interrupted: that of force has begun... Obedience ceases to be a duty!" In the evening, crowds assembled in the gardens of the Palais-Royal, shouting "Down with the Bourbons!" and "Long live the Charter!". As the police closed off the gardens during the nights, the crowd regrouped in a nearby street, where they shattered streetlamps. The next morning, 27 July, police raided and shut down the newspapers that continued to publish (including Le National). When the protesters, who had re-entered the Palais-Royal gardens, heard of this, they threw stones at the soldiers, prompting them to shoot. By evening, the city was dominated by violence and shops were looted. On 28 July, the rioters began to erect barricades in the streets. Marshal Marmont, who had been called in the day before to remedy the situation, took the offensive against the rioters, but some of his men defected to the rioters, and by afternoon he had to retreat to the Tuileries Palace. The members of the Chamber of Deputies sent a five-man delegation to Marmont, urging him to advise the king to assuage the protesters by revoking the four Ordinances. On Marmont's request, the prime minister applied to the king, but Charles refused all compromise and dismissed his ministers that afternoon, realizing the precariousness of the situation. That evening, the members of the Chamber assembled at Jacques Laffitte's house and decided that Louis Philippe d'Orléans should take the throne from King Charles. They printed posters endorsing Louis Philippe and distributed them throughout the city. By the end of the day, the government's authority was trampled. Louis Philippe ignored the document and on 9 August had himself proclaimed King of the French by the members of the Chamber. When it became apparent that a mob of 14,000 people was preparing to attack, the royal family left Rambouillet and, on 16 August, embarked for the United Kingdom on packet steamers provided by Louis Philippe. Informed by the British Prime Minister, the Duke of Wellington, that they needed to arrive in England as private citizens, all family members adopted pseudonyms; Charles X styled himself "Count of Ponthieu". The Bourbons were greeted coldly by the English, who upon their arrival mockingly waved the newly adopted tri-colour flags at them. The Bourbons were allowed to reside in Lulworth Castle in Dorset, but quickly moved to Holyrood Palace in Edinburgh, where the Duchess of Berry also lived at Regent Terrace. At the invitation of Emperor Francis I of Austria, the Bourbons moved to Prague in winter 1832/33 and were given lodging at the Hradschin Palace by the Emperor. In September 1833, Bourbon legitimists gathered in Prague to celebrate the Duke of Bordeaux's thirteenth birthday. They expected grand celebrations, but Charles X merely proclaimed his grandson's majority. In the meantime, Charles left for the warmer climate on Austria's Mediterranean coast in October 1835. Upon his arrival at Görz (Gorizia) in the Kingdom of Illyria, he caught cholera and died on 6 November 1836. The townspeople draped their windows in black to mourn him. 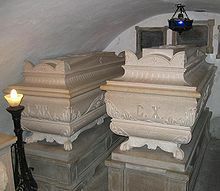 Charles was interred in the Church of the Annunciation of Our Lady, in the Franciscan Kostanjevica Monastery (now in Nova Gorica, Slovenia), where his remains lie in a crypt with those of his family. He is the only King of France to be buried outside of France. A movement advocating for Charles X's remains to be buried along with other French monarchs in Basilica of St Denis reportedly began a process of repatriation in late 2016, although the current head of the House of Bourbon, Louis Alphonse, Duke of Anjou has stated, in early 2017, that he wishes the remains of his ancestors to remain at the monastery crypt. Louis Antoine, Duke of Angoulême (6 August 1775 – 3 June 1844), sometimes called Louis XIX. Charles Ferdinand, Duke of Berry (24 January 1778 – 13 February 1820). The Count of Artois is portrayed by Al Weaver in Sofia Coppola's motion picture Marie Antoinette. ^ Mary Platt Parmele, A Short History of France. New York: Charles Scribner's Sons (1894), p. 221. ^ "Charles X | Biography, Reign, Abdication, & Facts". Encyclopedia Britannica. Retrieved 2019-02-24. ^ a b Munro Price, The Perilous Crown: France between Revolutions, Macmillan, pp. 185–187. ^ Évelyne Lever, Louis XVI, Librairie Arthème Fayard, Paris (1985), p. 43. ^ McConnachie, James (2004). Rough Guide to the Loire. London: Rough Guides. p. 144. ISBN 978-1843532576. ^ T. W. Redhead (January 2012). The French Revolutions. BoD – Books on Demand. p. 176. ISBN 978-3-86403-428-2. Retrieved 1 September 2013. ^ a b Hélène Haus (25 September 2016). "Et si les cendres du roi Charles X étaient transférées à la basilique Saint-Denis?" [Are the remains of Charles X to be transferred to Basilica of St Denis?] (in French). Le Parisien. Retrieved 20 February 2017. ^ a b A. K. (28 September 2016). "Francozi želijo ostanke Karla X. in družine iz Slovenije: "Pripadajo naši domovini"" [The French wish the remains of Charles X and family to be brought from Slovenia: "They belong to our homeland"] (in Slovenian). RTV Slovenija. Retrieved 20 February 2017. ^ Al. Ma. (19 February 2017). "Francoski princ Burbonski želi, da njegovi predniki ostanejo pokopani na Kostanjevici" [A French prince of Bourbon wishes the remains of his ancestors to remain at Kostanjevica] (in Slovenian). RTV Slovenija. Retrieved 20 February 2017. "Charles X" . The New Student's Reference Work . 1914. Marie Antoinette was the last Queen of France before the French Revolution. She was born an Archduchess of Austria and was the penultimate child and youngest daughter of Empress Maria Theresa and Francis I, Holy Roman Emperor. She became Dauphine of France in May 1770 at age 14 upon her marriage to Louis-Auguste, heir apparent to the French throne. On 10 May 1774, her husband ascended the throne as Louis XVI and she assumed the title Queen of France and Navarre, which she held until September 1791, when she became Queen of the French as the French Revolution proceeded, a title that she held until 21 September 1792. Louis XVII, born Louis-Charles, was the younger son of King Louis XVI of France and Queen Marie Antoinette. Louis XVIII, known as "the Desired", was a monarch of the House of Bourbon who ruled as King of France from 1814 to 1824, except for a period in 1815 known as the Hundred Days. He spent twenty-three years in exile, from 1791 to 1814, during the French Revolution and the First French Empire, and again in 1815, during the period of the Hundred Days, upon the return of Napoleon I from Elba. Yolande Martine Gabrielle de Polastron, Duchess of Polignac was the favourite of Marie Antoinette, whom she first met when she was presented at the Palace of Versailles in 1775, the year after Marie Antoinette became the Queen of France. She was considered one of the great beauties of pre-Revolutionary society, but her extravagance and exclusivity earned her many enemies. Louise-Élisabeth de Croÿ de Tourzel 11 June 1749 – 15 May 1832), the Marquise de Tourzel was a French noble and courtier. She was the Governess of the Children of France from 1789 until 1792. Decades after the French Revolution, de Tourzel published widely read memoirs, which presented a unique perspective on the royal family. Louis, Dauphin of France was the elder and only son of King Louis XV of France and his wife, Queen Marie Leszczyńska to survive to adulthood. He had a younger brother, Philippe, who died as a toddler. As a son of the king, Louis was a fils de France. As heir apparent, he became Dauphin of France. However, he died before ascending to the throne. Three of his sons became kings of France: Louis XVI, Louis XVIII and Charles X.
Louis Charles Auguste Le Tonnelier, Baron de Breteuil, Baron de Preuilly was a French aristocrat, diplomat and statesman. He was the last Prime Minister of the Bourbon Monarchy, appointed by King Louis XVI only one hundred hours before the storming of the Bastille. Charles of Orléans was the Count of Angoulême from 1467 until his death. He succeeded his father, John, and was initially under the regency of his mother, Marguerite de Rohan, assisted by Jean I de La Rochefoucauld, one of his vassals. Maria Theresa of Savoy was a French princess by marriage to Charles Philippe, Count of Artois, grandson of Louis XV and younger brother of Louis XVI. Some nineteen years after her death, her spouse assumed the throne of France as King Charles X.
Joseph Hyacinthe François de Paule de Rigaud, comte de Vaudreuil was a French nobleman at the court of King Louis XVI of France. He was the alleged lover of Gabrielle de Polastron, duchesse de Polignac, the favourite of Marie Antoinette and over whom he exerted a powerful influence.